Daedalus was an Athenian architect and craftstman, who was commissioned, by King Minos of Crete, the creation of a Labyrinth to contain the monstruous and ferocious Minotaur, who was half-ma, half-bull. Because Daedalus designed and built the Labyrinth, his knowledge of its structure was considered threatening by King Minos, who then imprisoned Daedalus and his son Icarus inside the same Labyrinth Daedalus had created. Being the labyrinth extremely complex, and keeping in mind the Minotaur, Daedalus fabricated wings for himself and Icarus. He tied feathers together, and secured them with strings and wax. 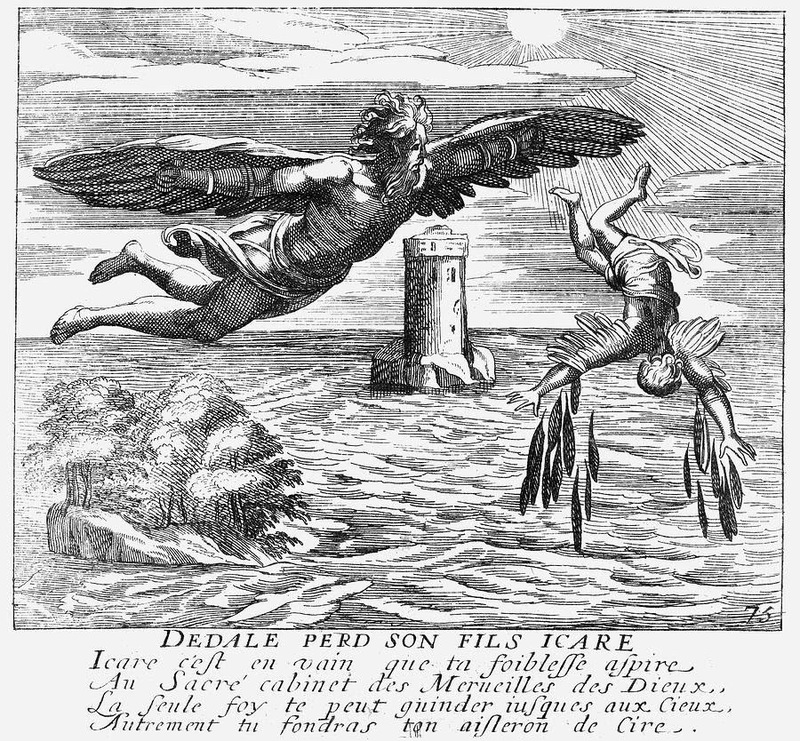 Daedalus warned his son Icarus not to fly too close to the Sun, but Icarus didn’t listen and the wax on his wings melted, so he died. Daedalus instead landed in Cumae, where he built a temple for Apollo and delivered to the god the same wings he had used to escape from the Labyrinth. The real meaning of the myth of Daedalus is the mind illusion we live in. Our mind, well depicted by the symbolic image of the Labyrinth (the contortions of the brain), is intricated and limited in the solutions it can find to problems. For instance, if we have relationship problems, our mind will only be able to find the solutions it already knows, unable to see beyond them. The only way to escape from this trap is using an intuition, that never originates in the mind, but comes from a deeper source: the soul. If something happens to me, the external world is to blame. Instead, when our action is led by our intuition, we move vertically (we fly), in the mind-free world of the soul. In this new place, we can find unexpected solutions and original ideas to solve our problems. Here, if something happens to me, responsibility always resides in myself. The VERTICAL THOUGHT transcends the source of all problems: our identification with the mind and, consequently, with time. Our orizontal and temporal mind keep us tied to the illusion that we always have to fight against something that “outside us” if we want to solve our problems and be happy. Do not follow the mass: be vertical, be free.